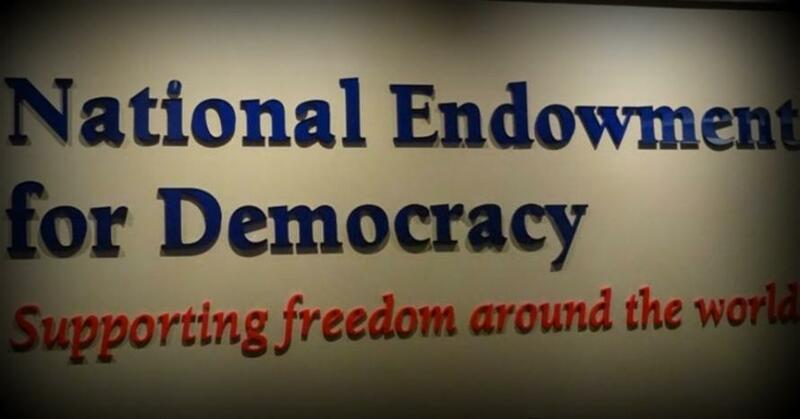 A bombshell new mini-documentary takes an inside look at a little-known but powerful and hugely influential group on Capitol Hill, the National Endowment for Democracy (NED). The film's producer, journalist Max Blumenthanl, goes inside one of the NED's recent events in Washington to expose the history and leadership behind what's described as "a taxpayer funded organization that has interfered in elections, mobilized coups, and orchestrated public relations campaigns against nations that resist Washington's agenda." Blumenthal covers a recent NED event highlighting Korean activists working to bring down the communist government of North Korea, and launches into the shady history of the group's semi-secretive operations. Introducing the mini-doc at his Gray Zone Project Blumenthal explains: "I covered the ceremony because these organizations are doing precisely what Congress accuses Russia-funded media outlets and troll farms of doing in the United States. They interfere in other countries’ politics with foreign money. The only difference is they do it openly, and in the name of spreading freedom." And Blumenthal continues, speaking of the history of the NED which has often worked hand in hand with US intelligence agencies to topple foreign governments: "Founded in 1983 by then president Ronald Reagan, the National Endowment for Democracy became an international vehicle for the neoconservative agenda." "Its founding cadre were Cold War ideologues who were, like so many early neoconservative operatives, former Trotskyists who once belonged to the Social Democrats USA party," narrates Blumenthal. Blumenthal's analysis and questions he poses to NED officials and attendees at the event demonstrate how the group openly seeks to "weaponized civil society and media" against governments standing in Washington's way, or even on behalf of major US corporations seeking the muscle their way into emerging foreign markets. Lately, the organization has been leading efforts to destabilize both North Korea and China, and his interviews at the NED's latest civil society "activist" event details with surprising clarity some of the ongoing projects the NED is sponsoring. In one particularly notable segment of the documentary, Blumenthal corners Democratic House minority leader Nancy Pelosi, among the NED's most visible supporters, and asks her about the hypocrisy of the NED's ongoing meddling in foreign politics at the very moment that US leaders and the national media are engaged in hysterics over alleged Russian meddling in US elections. Blumenthal rightly concludes the following: "America remains obsessed with the specter of Russian interference and Moscow’s supposed active measures against our political system. But at the same time, official Washington celebrates its own taxpayer funded meddling machine as an engine of 'democracy promotion'." And he asks: "Does the American public know what’s being done with its money, and will there ever be a public debate on the consequences of Washington’s regime change efforts?"